Thirteenth century arcading in the Refectory at Mattersey Priory (A. Nicholson, 2000). Travelling on the Great Northern Railway, six miles beyond Retford, there is a station at the village of Ranskill, the name of which carries us back to the Danish invasions. Our local literature has been greatly supplemented by the able parochial history of Blyth by the Rev. John Raine, who regards Ranskill as a Danish word pure and simple. Ranskill is Ravenskelf, the shelf or shelving knoll of the raven; another form of the word being Rasheif, by which definition a village and station north of York is called. The raven was consecrated to the god Odin, and the word enters into the combination of the names of two or three places, such as Ravensfield and Ravenspur, in which may be discerned unmistakable rallying centres for the hardy Northmen. The owner of the village at the Conquest was the Archbishop of York, and the most notable circumstance in the history of Ranskill is its long association with the occupants of this see to whom it has paid suit and service for centuries. Two miles away, on the banks of the river Idle, lies Mattersey, where once stood a noble abbey. Some time in the twelfth centurythe exact date is difficult to fix Roger de Maresay founded a monastery, dedicated it to St. Helen, and endowed it with property in the immediate vicinity. Six monks found a retreat within its walls, and their religious life was conducted according to the Order of the Gilbertines. To some extent the Gilbertines were a local body, for they were brought into existence by Gilbert, the priest of Sempringham and Tissington in Lincolnshire; but their code of regulations was substantially that of the Benedictines. For nearly four centuries the monastery continued to flourish, and received additional benefactions to those of its founder. A hundred years after the death of Roger de Maresay, a descendant of his, Isabell de Chauncey, left all her property in Mattersey and Thorp to the priory at the former place, and confirmed the monks in the enjoyment of the gifts of her predecessors in the parishes of Gamston, Elksley, West Retford, Misson, and Boulton. From these endowments the convent grew rich, and the Prior became a dignitary of considerable importance in the locality. The privilege of being toll-free at every market, bridge, and port in England was claimed by him, and at a later period a market was established at Mattersey itself, where the country people could buy and sell their produce. The monks appear to have lived very comfortably in their secluded village, till the great Act of 1536 suppressed all the lesser monastic institutions. In 1539, Thomas Woodcock, the Prior, and four monks, surrendered it, the former being allowed a pension of £26 13s. 4d. The total income of the lands and mills was £51 14s. 2d., and the abbey was granted to Anthony Nevile, Esq. An heiress of the Neviles married Sir William Hickman, whose family resided there until the last century. 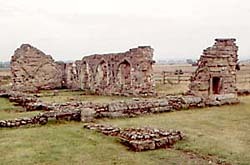 Remains of the priory church next to the farmhouse (A. Nicholson, 2000). 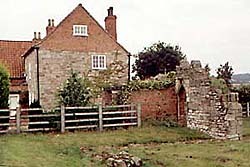 The site of the abbey is now occupied by a farmhouse. The road to it is through an occupation lane, which leaves Mattersey near the church, and at a distance of about half a mile turns to the left until it reaches the Abbey Field. The front of the house looks over the river to Wiseton, and immediately adjoining it, in the garden, are several distinct portions of the ruins of the ancient monastic edifice. In the field are the remains of what we suppose to have been the priory church. The Austin canons, whom the Gilbertines closely resembled, were like a community of parish priests living under a rule, and they had churches with naves of considerable length to accommodate large congregations. If the ruins in the field are those of the church, it must have been an edifice capable of holding a large number of worshippersfar more than would be likely to be gathered together on ordinary occasions from so scattered a district. It is impossible to stand near these venerable walls without recognising the judicious choice of ground which was made by the original builders. It is sufficiently high to be out of the reach of floods, and while it has the advantages which proximity to a little river would give it, there is a fine stretch of landscape around, bordered in the distance by gently sloping hills. There are more of the ruins remaining than we expected to find, and we trust they will continue to stand for centuries as an evidence of the long connection which existed between Mattersey and its Gilbertine monks.